I would like to begin by introducing you, dear reader, to a good friend of mine. Meet Glucose. She is a humble molecule by herself, yet she actually is aptly designed for what she has to do. Glucose is, simply, the end metabolic fate of almost every dietary carbohydrate that is burned for energy by higher animals, with the one major exception that I know of being hummingbirds (but that is another post). We may rely upon glucose for the main dietary energy, or we may rely upon fats. Students of organic chemistry will quickly note, if they build the model, that the heterocyclic form and orientation of the hydroxyl groups represents the absolute energetic minimum that can be achieved using the chemical formula C6H12O6. The creation did not waste its effort in building an inefficient system. Because most creatures make extensive use of dietary glucose, in various forms, for their caloric intake, the question arises as to what form the dietary glucose should take. The fact that we see no repositories of liquid-syrup storage organs in nature should immediately provoke the thought that perhaps this mode of energy storage is impractical. There are, of course, succulent, sweet fruits of all kinds, but because the purpose of these structures is to provide a means to disseminate the seeds of the plant through ambulatory creatures, this is the exception that proves the rule. Thus, we should instead look to a more efficient energy store than an aqueous syrup-pot. One option would be to store crystallized sugars, but this contradicts the highly structured, watery paradigm of life that we see throughout the creation, and at any rate is energetically costly even as a thought experiment. Thus, only one other feasible option remains: to condense glucose into a polymer unit. The cyclic form of glucose itself is the result of a condensation reaction, and the C1 adjacent to the ring oxygen remains the most electron-deficient atom of the molecule. By contrast, the most electron-rich labile carbon atom of the ring is C4, and we should therefore look to this as the center for the condensation of two glucose molecules. 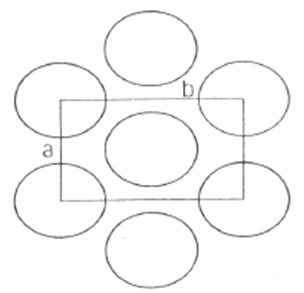 Because the ring must open for the condensation reaction between C1 and C4 of two glucose units, the directionality of the bond at C1 of the first, is not fixed, and the carbon is called anomeric. 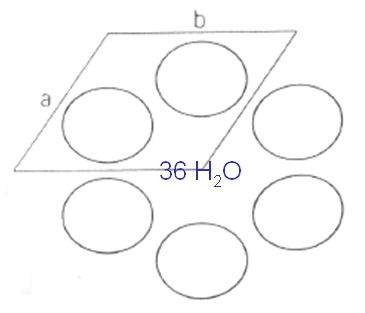 If facing downward, the bond of the C1 – C4 oxygen is called an α-linkage; if facing upward, the bond is instead termed a β-linkage. As the chain length elongates, the resulting sugars produced from homogeneous mixtures of such linkages do not significantly differ in properties. As the chain lengths increase, however, significant differences begin to appear. *Not typically encountered, nor easy to isolate, and so I know of no general term equivalent to maltodextrin of this size range for β-(1à4) chains in common use. The different linkages, α-(1à4) and β-(1à4), although a subtle difference at first blush, result in very different end results that can be mainly put down to the minimum energy conformations assumed by the different chains of individual glucose units (or, to be slightly more precise, anhydroglucose units, but that is a distinction unimportant to us at this point). The α-(1à4) linked chain, when carried out to very long degrees of polymerization (DP) results in a helical polymer termed the amylose component of starch, although in real systems amylose never appears as a purely linear chain. 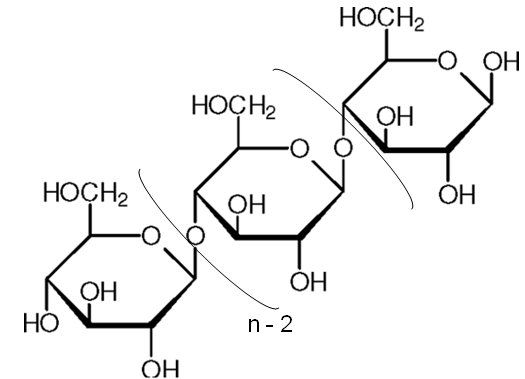 If we carry out the same polymerization on a purely β-(1à4) linked chain of glucose units, we instead get the ribbon-like cellulose. The natural process of starch biosynthesis also introduces α-(1à6) linkages to the chain backbone. 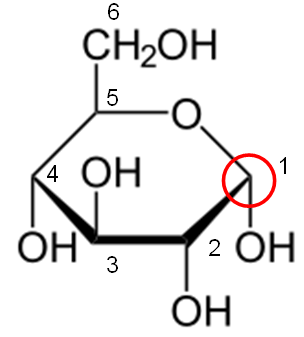 Naturally-occurring amylose contains a small amount of these linkages, which we will here call branch points. However, amylose is just one component of the compact energy storage of plants known as starch, and it is usually the minor component. Instead, the majority (70 – 80%) of material in most starches consists of amylopectin, which is a monster of a molecule worthy of much study. Perhaps the best and most vivid conceptual illustration for the nature of amylose was proposed by Susumu Hizukuri, who created a chandelier or bush-like structure of forged chain-links suspended from a single originating chain (see below). Because amylopectin molecules are so large – indeed, they are the largest polymers, in terms of molecular weight, found in nature – they actually contain multiple crystalline and amorphous domains and are responsible for the overall crystallinity of starch granules. The branch-chains of amylopectin accomplish this by forming coiled double-helices of glucose polymers. 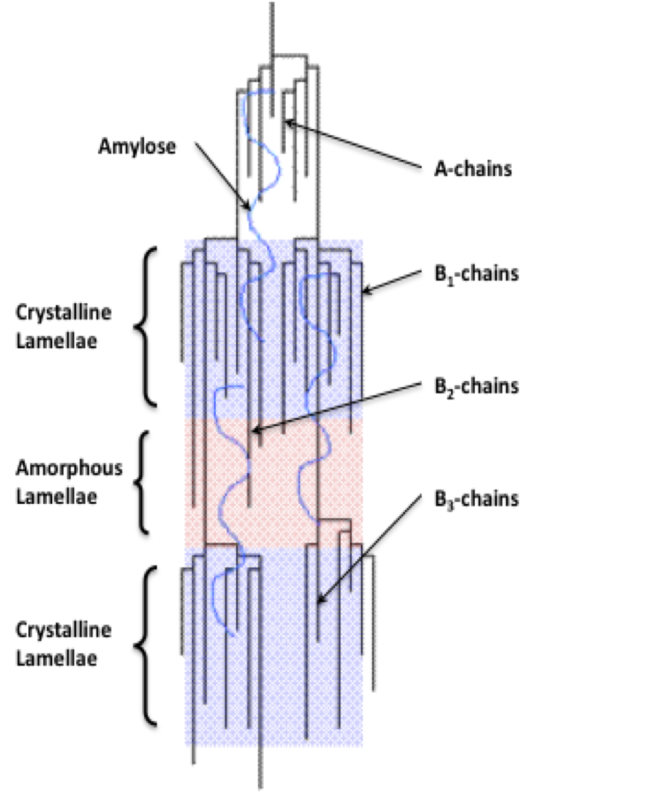 Even at this level, this is not an easy system to describe, for the length of these chains can thereby dictate the crystalline nature and properties of starch. The two main categories of starch crystalline structure are the A-type and the B-type, which are distinguished based on the unit cell of starch-chain double-helices. A third type, the C-type, is more properly a mixture of the A-type and B-type structures within the same starch granule. A fourth also exists but is of a special character and so shall not be treated here. Confused yet? Good. We will not muddy the waters here further with an exact discussion of the limits of amylopectin chain-lengths that give rise to these characteristics. A decent rule of thumb at this point is that the A-type structure results from closer packing of the double-helices of shorter amylopectin branch-chains, whereas the B-type results from the looser packing of longer amylopectin branch-chains. Helpfully, cereal starches generally fall into the A-type classification, whereas tuber starches (with the notable exception of tapioca) generally fall into the B-type. Pulses and bananas of many varieties are exemplary of the C-type. All of this is merely a foundation. In talking about starch, where very fine differences in chemical structure and characteristics can have a profound influence on the properties of the resulting material, these foundational aspects are very often neglected by professionals dealing only with higher-level applications of these materials, such as in feeding studies. It is my intention to clarify these matters for the layman and to describe, in as much detail as I can, why often the conventional wisdom on these matters is merely falsehood. Note: I did not have access to my usual chemical drawing program when making this post, and as such I must confess that the images contained in this document were shamelessly lifted from Wikipedia and doctored accordingly. For the tireless editors of that ultimate repository of man’s useless knowledge, I express my deepest gratitude.